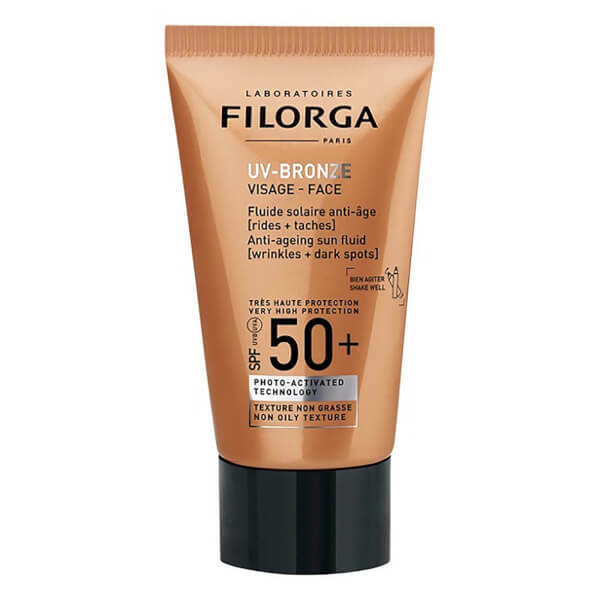 Protect your visage from harmful sun exposure with the Filorga UV Bronze SPF50+ Face Cream; a triple-action cream that shields skin from external aggressors whilst intensely moisturising and boosting your sunkissed glow. Enriched with the brand’s proprietary Anti-Ageing Fluid designed to combat wrinkles and dark spots, the cream provides very high protection against further damage, whilst photo-activated technology delivers powerful antioxidant benefits to fight signs of ageing. Combining a powerful peptide complex with Hyaluronic Acid and NCTF® (Filorga’s New Cellular Treatment Factor), the cream helps to regenerate tissue and smooth the skin, whilst Hop Extract regulates melanin synthesis to visibly blur the appearance of photo-induced hyperpigmentation. Shake well before use. Apply evenly to the face before sun exposure, repeat often, especially after going in the water or drying your skin. Although your skin is well protected, avoid sun exposure during peak sunshine hours. Do not directly expose babies and young children to the sun. Excessive sun exposure is dangerous. Aqua (Water), Diisopropyl Adipate, Ethylhexyl Methoxycinnamate, Diethylamino Hydroxybenzoyl Hexyl Benzoate, Homosalate, Methyl Methacrylate Crosspolymer, Methylene Bis-Benzotriazolyl Tetramethylbutylphenol [Nano], Bis-Ethylhexyloxyphenol Methoxyphenyl Triazine, C12-15 Alkyl Benzoate, Cyclopentasiloxane, Silica, Beheneth-25, Ethylhexyl Triazone, Polymethyl Methacrylate, Dimethicone, Glyceryl Stearate Citrate, Polyester-7, Niacinamide, Neopentyl Glycol Diheptanoate, Squalane, Tocopheryl Acetate, Pentylene Glycol, Decyl Glucoside, Cetearyl Dimethicone Crosspolymer, Hydroxyethyl Acrylate/Sodium Acryloyldimethyl Taurate Copolymer, Caprylyl Glycol, 1,2-Hexanediol, Lecithin, Sodium Laureth Sulfate, Hydrogenated Phosphatidylcholine, Lysolecithin, Parfum (Fragrance), Glycerin, Aminomethyl Propanol, Citric Acid, Glycine Soja (Soybean) Oil, Polysorbate 60, Sorbitan Isostearate, Xanthan Gum, Phenethyl Alcohol, Phenoxyethanol, Caprylhydroxamic Acid, Disodium Edta, Lepidium Sativum Sprout Extract, Beta-Carotene, Daucus Carota Sativa (Carrot) Root Extract, Tocopherol, Benzyl Salicylate, Hexyl Cinnamal, Linalool, Alpha-Isomethyl Ionone, Limonene.